When you Rent a condo and come to Clearwater beach you will visit the miles of broad, white, fine-grained sandy beaches and sparkling waterways of Clearwater Beach and you'll discover why the area is named as such (Clearwater is literally translated "Clear Water" from the native Indian "Pocotopaug') . Consistently ranked among the top beaches in Florida and the nation with it's soft white sand, excellent swimming conditions and plenty of beach volleyball. 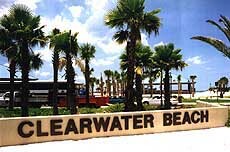 Clearwater also holds the record in consecutive sunny days in one year (361 days) and offers outdoor activities and attractions for families, couples, and young people alike. Perhaps one of the most visible and frequently visited attractions on Clearwater Beach is the recently renovated Pier 60 which offers a 1050 ft. fishing pier and on premises bait/tackle shop, playgrounds for children and many beachside vendors and shopping. Sunsets at Pier 60 are a must-see for any visitor or resident of Clearwater Beach. Every day, two hours before sunset you'll find local artisans, street performers and local musicians gathering to observe the setting of the Florida sun. This evening gathering is free and is a fun and exciting experience for all ages. 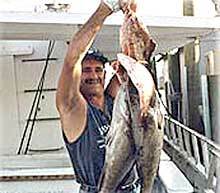 If you prefer to do your fishing in the open sea, check out one of the many deep-sea fishing charters at Clearwater Marina, home of the largest recreational fishing fleet on the West Coast of Florida. You can spend a full or half day fishing on the spacious Queen Fleet Rod rentals are available, and the bait charge is included. 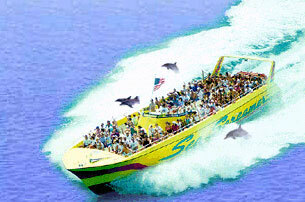 You can also enjoy a evening cruise - visit their web site for more information. If fishing isn't your thing, take an exciting ride on the 50-foot catamaran Kai-Lani, try fantasy and party cruises aboard Captain Memo's Pirate ship or head out on the world's largest speed boat, the Sea Screamer, where dolphin sightings are guaranteed. For those who want dining & seightseeing along the coast line, The Show Queen is a sixty-five foot triple deck riverboat specifically designed for harbor cruises on Clearwater Beach, Florida. The riverboat is designed with 3 decks and offer full service dining, bar service, state of the art sound system and a dance floor on each deck. Once you've returned to shore, learn about the native marine life you may have seen during your sea adventure at the Clearwater Marine Aquarium. This aquarium is home to many sea animals who have been rescued and rehabilitated. 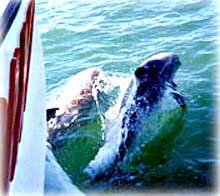 The ultimate goal is to release them back into the wild, but many become permanent residents due to their injuries. Among the full time residents are two North American river otters, a few dolphins and some sea turtles. There is a small "pool" where you can get up close and personal with sting rays, starfish, and other small marine life. For those of you who want to enjoy some land-based fun, bring the kids to Celebration Station for go-karts, video games, and miniature golfing. Boatyard Village is an interesting and realistic recreation of a 19th century fishing village with many shops and restaurants to visit while looking around. Feeling energetic? Hit the pavement running, biking or roller-blading on the Pinellas Trail, the longest and most recognized urban trail in the U.S. With 34 miles of boardwalk winding through parks, waterways and neighborhoods, you'll never run out of room to ride! If you prefer to walk, the three-mile trek to Caladesi Island is worth the effort (or you can always take the ferry). Ranked as the finest beach in the United States by world-renowned Dr. Beach, Caladesi Island offers an undisturbed natural habitat for its variety of nesting Osprey, Snowy Egrets, Great Blue Heron and many other species of bird, making it one of the best birding areas in Southwest Florida. To visit another top-rated beach, take a short hike South over the bridge to Sand Key. Sand Key is the island that starts at Sand Key County Beach Park in the north and runs 12 miles down to John's Pass (end of Madeira Beach). 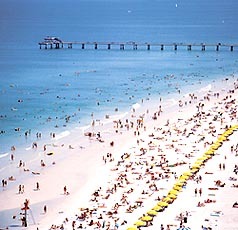 Not a city per se, the term Sand Key is often used to refer to the section of Clearwater Beach south of Sand Key Park. This park used to be ranked as one of the top beaches in the nation by Dr. Beach (a.k.a. Dr. Stephen Leatherman) - we still think it is the top beach in the area. After the sunsets, the party is just beginning at Clearwater Beach's local hot spots. Several of the hotels have beachfront tiki bars. Depending on where you stay, you can walk up and down the beach stopping at places for a bite to eat and a drink. For those who like to relax and enjoy relaxing music Shepard's Tiki Bar is the right place to visit. Whether you're spending your spring vacation or winter holidays in Clearwater Beach, you're sure to find some sort of seasonal festival going on. Celebrate the beginning of summer with 100,000 other beach fans at the Fun 'n Sun Festival. This May celebration is marked by local musicians, sports competitions, plenty of free food and the highlight of the event, a lighted boat parade. Jazz fans will not want to miss the annual Clearwater Jazz Holiday in October. Four days and nights of the finest jazz musicians makes this event the largest free jazz festival in the Southeastern United States. Spending your holidays at the beach? Enjoy a free holiday walking light display at sunset on Pier 60 the entire month of December. You'll never have a hard time finding something to do in Clearwater Beach, and better yet: because Clearwater Beach is so small, you can walk to it all!